The city was once the heartland of Telugu culture. The capital of the Kakatiya rulers, Warangal today contains some of the best forms of architecture, especially in temples. The 1000-pillars temple and the Ramappa temple in the district are glowing examples of the exquisite architecture patronized by the Kakatiyas. Warangal city today is part of a cluster of three towns – Warangal, Kazipet and Hanamkonda, the district headquarters. Bound on the Northern part by the mighty Godavari River, the district has large tracts of forest and an array of flora and fauna. The district is also known for its picturesque lakes, hand-woven thick cotton fibre carpets, scroll painting done on cloth in earth colours mainly at Cheriyal nearby, and sheet-metal artistry at Pembarti. Air: The nearest airport is Hyderabad, which’s 130 km away. Hyderabad is well connected by air with all the major cities of India. Rail: Warangal and the adjoining Kazipet fall on the Chennai – New Delhi Grand Trunk route. Hence, train services are available to Warangal from all the major cities of India. Road: Warangal is easily accessible by road from Hyderabad and Vijayawada. Regular bus services connect Warangal with Hyderabad, Vijayawada, and Vishakhapatnam. Tirupati and Kurnool in Andhra Pradesh. Thousand Pillar Temple: The famous “Thousand Pillar Temple” built in 1163 A.D. by Rudra Deva, is situated between Hanamkonda and Warangal. An excellent example of Kakatiya architecture, built in the style of Chalukya temples–a star-shaped and triple-shrined, with perforated screens, exquisite icons and rock cut elephants. Warangal Fort: The Kakatiyas built Warangal Fort, 12 km from Hanamkonda, during the 13th Century. The impressive fort has four huge stone-gateways. Built by one of the Kakatiya Kingsk Ganapathi Deva and his daughter Rani Rudrama Devi, one can still spot some exquisite pieces of sculpture here, Other places of tourist interest in Warangal are Prataparudra Planetarium, Kakatiya Musical Garden, Rock Garden and Archaeological Museum, Kakatiya University campus, Samkritika Vihar and Laknavaram Lake. Pakhal Lake: The sanctuary around the beautiful Pakhal Lake lies about 60 km from Warangal. A guesthouse run by the Forest Department is located on the shores of the lake surrounded by wooded hills. Moonlit nights are a heavenly experience. The lake itself was excavated in the 13th century. Ramappa Temple: Ramappa Temple at Palampet village is 70 km from Warangal and about 200 km from Hyderabad. The Ramalingeswara Temple, popularly called Ramappa Temple, is a classic example of Kakatiyan architecture, the construction of the temple dates back to 1213 AD and originally, there were said to be three structures but only one is presently intact. The Shivalaya stands majestically on a six-ft high star-shaped platform. This temple is famous for its rich, intricate sculpture covered walls, pillars, brackets and ceilings. Ramappa Lake: As was the tradition of Kakatiya rulers, a tank was excavated adjacent to the temple, which is called the Ramappa Lake and is known for its scenic beauty. Palampet: Better known as the place, which hosts the Ramappa Temple. Palampet village is 70 km from the district headquarters town of Warangal. The Ramalingeswara temple, a classic example of Kakatiyan architecture, is an archaeological wonder. The construction of the temple dates back to 1213 AD and originally, there were said to be three structures but only one is intact and the Shivalaya stands majestically on a six-ft. high star-shaped platform. Eturnagaram Sanctuary: This sprawling sanctuary along the Godavari River is about 80 km from Warangal and 210 km from Hyderabad. Spotted deer, black buck, Neelgai, sloth bears, panthers and tigers inhabit the forest area interspersed with low hills. Kolanupaka: Located on the Hyderabad-Warangal road, 80 km from Hyderabad, Kolanupaka has a number of temples and shrines, prominent among them being one of the oldest Jain temples, over 2000 years old with a 5-ft jade idol of Mahavira. The Sri Veeranarayana Temple and the Someswara Temple and the State Archaeological Department has set up a museum in the Someswara temple complex with exhibits mainly relating to temple architecture. Kolanupaka is located 80 km from Hyderabad and 70 km from Warangal. The nearest railway station is Alair. Pembarti: Pembarti is famous for its sheet metal art, which flourished during the reign of the Kakatiyas. Even now Pembarti is known for its handicrafts and a Copper and Silver Metal Craft Centre here is worth a visit. 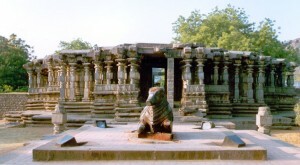 Pembari is located about 100 km from Warangal. This entry was posted in Andhra Pradesh, Warangal. Bookmark the permalink.